When we launched, SCE funded Southill Solar through a community share offer which raised £1.1m and loans totalling £3.4m. Since then, a significant proportion of Southill Community Energy’s income has gone towards paying interest on those loans. We have been working hard to reduce these costs wherever possible. Last year we signed new loan agreements with West Oxfordshire District Council and The Phone Coop that allowed us to start paying off our highest cost debt. And in February, we launched our Bond Offer to raise funds to pay off the remainder of our most expensive loan. Lower interest payments mean a more stable business, better security for our members and more for our community funds. We're very happy to say that our bond offer has now closed - we raised £350,000 in bonds. Many thanks to all who subscribed - a mix of existing members and new supporters. Now winter is drawing in it’s a good time to reflect on land management at Southill and what we’ve collectively managed to achieve this year. Southill is a community project and the land management has benefitted from the ideas, expertise and elbow grease of a large number of people in this past year. On behalf of Southill, thank you to all for your hard work to date. I’m looking forward to seeing the wildlife habitats really starting to flourish in 2018. The year started with the planting of a wonderful orchard of 60 fruit trees including 30 traditional varieties of apple, pear and nut carefully selected by Christine Elliott. A big crowd of volunteers turned out to help with planting on a blustery January morning, with Christine and 2 horticulturalists from Nicholsons leading the charge. The fruit trees will be managed by Christine as a community orchard, with plenty of windfalls being left for wildlife too. In the same morning, we planted small clumps of hawthorn, crab apple and field maple along the road boundary which will grow up into short, dense trees that fill the hedge gaps and provide great habitat for birds. Our plans to create new grassland habitat were thwarted by a very dry spring. However, the rain returned in late May and we were able to start seeding. First, we seeded the margins of the entire site with a broad strip of tussocky grassland and wild flowers. This mix got off to a slow start in the dry conditions, but some heavy summer rainfall and a mild Autumn has helped them catch up. This habitat should provide a lovely floral display through future summers and will provide great foraging for birds and insects. Southill’s unique design means only the lower half of the site (nearest the railway) is covered in solar panels, and the entire upper half of the site (nearest the road) has been set aside for wildlife. One of the delights of this past year has been watching the skylarks displaying and foraging for their young in this upper area. Thanks to Louise and Alan Spicer, and to Bird Aid (part of the Wychwood Project), we have for the past 2 years hired a bird specialist, Tony Powell, to undertake a breeding bird survey through the spring and summer. His survey last year revealed 6 pairs of nesting skylarks and a similar number appear to be nesting here again this year, following the installation of the panels. Further, there were 48 species of bird observed overall – a surprisingly high number, and something we aim to build upon. 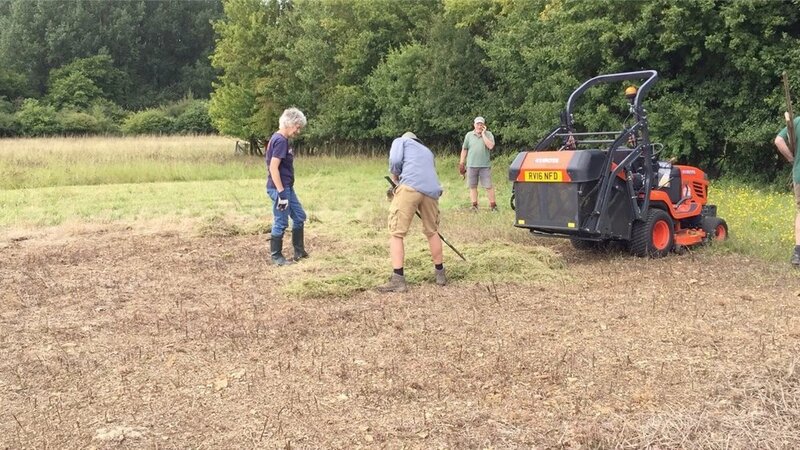 We seeded the bottom of the south field (next to Fawler mill) with a wild bird seed mix which will help feed the resident yellowhammers and linnets through the sparse winter months. This bird seed mix has done very well on the deeper soils and the quinoa and kale crops are now heavy with seeds. In late summer, we sowed a wild flower meadow on the upper half of the site. In order to minimise disturbance to the skylarks, meadow seed was sown on the southern field, but the northern field was left fallow so the skylarks can breed there undisturbed next spring. We selected a wild flower mix that was formulated especially for the local limestone soils. All the seeds used on site have been provided by Costwold Seeds, a local seed merchant, and sown by Rob Hobhill and his team from Ditchley. We inherited a small wild flower meadow at the very north of the site which is estimated to be at least 20 years old, and every summer is abuzz with bumblebees and butterflies feeding on the wild marjoram and St John’s wort. In August we took a cut of green hay and used it to seed a small area of neighbouring bare soil. 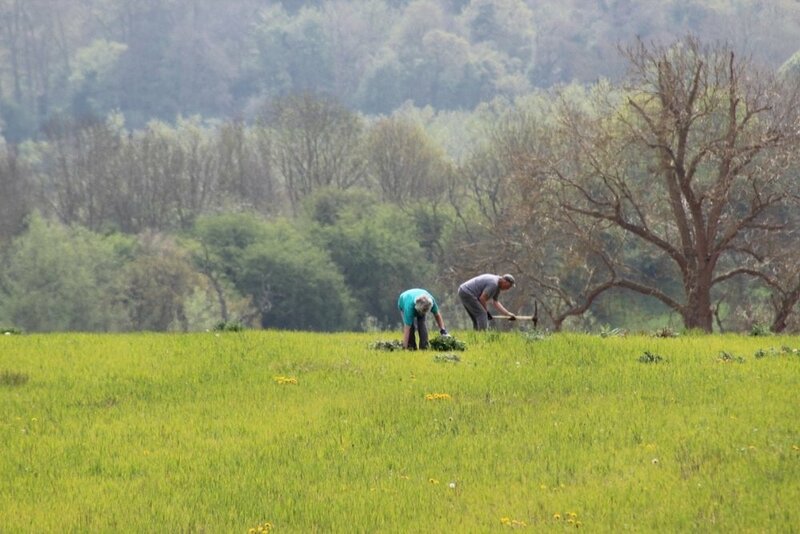 The idea with green hay is you cut the grasses and wild flowers in late summer (once their seeds have set), then spread them on a newly cultivated site. The seeds then fall off their stalks onto the bare soil where they germinate the following spring. We hope to repeat this process year-on-year, to spread the flowers from our meadow across much of the northern part of the site. As many of you know first hand, we’ve had a real battle with weeds across the site as we’ve started the transition from farming to wildlife management. Thanks to so many of you for pitching in repeatedly over the spring and summer, starting with a hugely successful digging out of perennial thistles and then later in the year, hand pulling many hundreds of ragwort plants from the site. A special thanks to Anne Miller, who has been the driving force behind these weed-busting missions. Tom has filmed one of his regular visits to check the hive. He talks us through what he's doing as he methodically checks the health and behaviour of the bees, and shows how the hive is settling and starting to produce honey. It's an enthralling look inside a working colony of bees, and an insight into the beekeeper's world. Our bees are doing well - especially as they were a new, young colony. And Tom doesn't get stung once! Our bees are generating a bit of a buzz. That's mainly due to the exciting innovation of the thermosolar beehive. This is a step-change in the way that beekeepers can treat their bees against the Varroa mite – without using chemicals, pesticides or harming the bees. Check out what BBC South had to say about our bees. Southill Solar installs the UK’s first thermosolar beehive – which uses sunlight to protect bees against the Varroa mite. On Sat 3 June, Southill Solar is proud to welcome our new resident colony of bees. The bees are an important part of our biodiversity plans. We’re using wildflower meadows and seed-rich planting to make the Southill Solar site a haven for all manner of birds, insects and mammals. What’s more, Southill Solar’s bees will live in a thermosolar beehive – the first one to be installed in the UK. The thermosolar hive uses solar power to kill parasitic Varroa mites. It works by raising the temperature of the hive’s brood nest to 47 degrees C. At this temperature, the mites are killed off but the bees remain unharmed. This is a step-change in the way that beekeepers can treat their bees against the Varroa mite – without using chemicals, pesticides or harming the bees. Tom Worlsey, Southill Solar’s new beekeeper, says, ““Right now, more than ever, bees need our help to survive. What is good for the bees, is good for all of us”. Our bee populations are under constant attack from parasites, disease, and agricultural pesticides. The Varroa mite is an endemic parasite present in all bee colonies. Varroa transmit many of the diseases that affect the health of our bees. Until now, beekeepers have used a variety of pesticides or chemical treatments to try and kill off the parasites. However none of these treatments are 100% effective, and none are particularly kind to the bees. The treatments often kill off many of the bees, as well as the mites. Varroa mites have developed resistance to many of the treatments, and the chemicals used can also contaminate the honey if not applied correctly. The thermosolar hive has the potential to do great good. What’s next for Southill Solar’s bees? Tom thinks the hive will produce about 15-20 kg of honey in its first season, and maybe double that in future years. So watch this space for some wonderful, community-owned, solar-powered, ethical AND pioneering honey to spread on your toast. Come and meet Tom! He will be at Charlbury’s Riverside Festival (29 and 30 July) to talk about Southill Solar’s hives, and bees in general. Come down and say hello to Tom and the Southill Solar team there.